A keto or low-carb lifestyle can be very effective for achieving and maintaining a healthy weight. In addition to increasing fat burning and reducing insulin and blood sugar levels, very-low-carb diets help control appetite and promote satiety, which often leads to a spontaneous reduction in calorie intake. However, plateaus are common during weight loss, regardless of diet. In fact, there are some foods that are technically allowed on a keto diet yet may lead to plateaus or stalls. Here is a list of 7 keto and low-carb foods that can cause weight loss plateaus. Bulletproof coffee (BPC) was created by Silicon Valley “biohacker” Dave Asprey back in 2009 and has become very popular among keto and low-carb enthusiasts. The original ingredients are basic, although over the years there have been several variations. However, most of them are high in calories and fat. This recipe provides approximately 400 calories, and many people report that it keeps them full for many hours. Drinking BPC in place of breakfast likely won&apos;t cause any problems as long as you make up for the lack of protein, vitamins, and minerals at your other meals. However, some people may find that consuming bulletproof coffee on a regular basis may cause their weight loss to stall. Although the effects of replacing a meal with BPC haven&apos;t yet been formally studied, research suggests that your body doesn&apos;t perceive liquid calories in the same way as solid food that requires chewing, which may lead to higher calorie intake at subsequent meals (1, 2, 3, 4). It&apos;s important to note that these studies used higher-carb liquids, so it&apos;s possible that BPC&apos;s effects on calorie intake later in the day could be different. However, if you drink BPC regularly and are trying to break through a plateau, it may be a good idea to track your intake to see how many calories you&apos;re consuming overall. The KetoDiet Buddy—our online Keto Calculator—can help you determine your personal calorie and macronutrient needs for weight loss. Nuts are delicious and healthy keto-friendly foods. Most types are low in net carbs yet high in fiber, monounsaturated fats, and important micronutrients like vitamin E, magnesium, and potassium. However, they&apos;re also fairly high in calories, and many people find it difficult to eat only a few at a time. In fact, Dr. Atkins didn&apos;t allow nuts in the initial Induction phase of the Atkins diet in order to promote maximal weight loss. And he believed that nuts should be among the first foods to go when stalls or plateaus occurred. 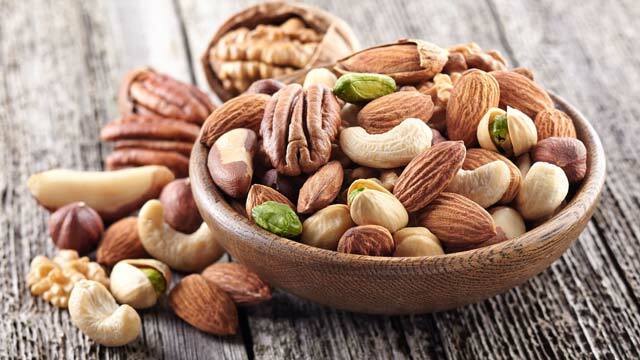 If you&apos;re sticking to your carb limit yet not seeing any weight loss, try limiting your nut intake to an ounce (28 grams) per day, or even avoiding them altogether until you begin losing again. Note: Brazil nuts are extremely high in selenium, so it&apos;s best to limit them to 2-3 per day in order to prevent toxicity. Please refer to my article about nuts and seeds on keto for more information about their calorie and carb content. Like nuts, cheese is another healthy, satisfying low-carb food that can be difficult to consume in small amounts. Although studies have failed to show a relationship between high-fat dairy foods and weight gain, it&apos;s notorious for causing weight loss plateaus in some who follow keto and low-carb diets. Indeed, anecdotes abound of people losing weight after removing cheese from their diets following stalls of several weeks or even months. Although its effects on weight don&apos;t appear to be universal, some people seem particularly sensitive to the insulin-raising effects of casein and whey in cheese. This response—coupled with cheese&apos;s delicious taste that make it easy to overindulge in—can lead to weight loss difficulty in susceptible individuals. To break through a plateau, consider limiting cheese to a 1-ounce (28-gram) serving twice a week if you don&apos;t want to give it up altogether. Please refer to my article about dairy on keto for more information. Commercial low-carb meals, bars, and other products may seem like an ideal option for busy people who follow a keto lifestyle for weight loss. However, to take off weight healthfully and sustainably, both carb content and food quality matter. Unfortunately, as this way of eating continues to grow in popularity, many products with questionable ingredients are being marketed to the public as “keto” or “low carb,” and some of them may interfere with weight loss. Dr. Atkins was ahead of his time when it came to carb restriction and whole foods nutrition, but the company that bears his name today uses several less-than-healthy ingredients in their products. For instance, their Pepperoni Pizza and other frozen entrees contain soy, wheat, maltodextrin, and cornstarch. Some Atkins bars like Cookies n&apos; Creme are sweetened with maltitol, a sugar alcohol that can be partially absorbed and raise blood sugar, whereas the White Chocolate Macadamia Nut Bar and others contain added sugar. 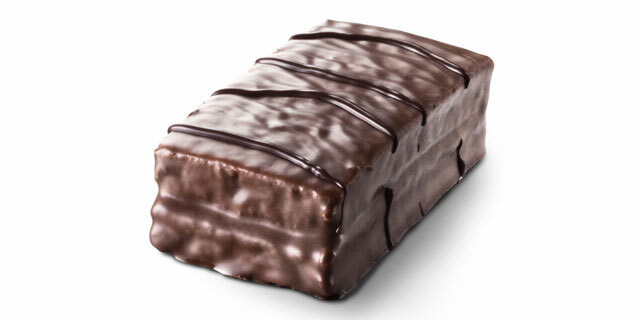 Many One Bars contain a blend of maltitol, sugar, and isomalto-oligosaccharides (IMOs). In studies, IMOs have been found to raise blood sugar and insulin levels (5, 6). Although responses seem to vary from person to person, it&apos;s possible that consuming this sort of product could cause problems from a weight loss standpoint. If you eat processed low-carb products, it&apos;s important to read the ingredients labels to see what they actually contain rather than rely on the often misleading “net carbs” listed by the manufacturer. Moreover, avoiding or strictly limiting all types of processed convenience foods and focusing on fresh, whole food may help you start losing weight again. Keto and low-carb diets are typically high in fat. Generally speaking, low-carb diets contain more than 50% of calories as fat, and keto diets provides about 65-80% of calories as fat. 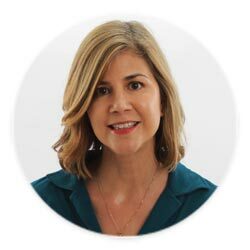 In recent years, the notion that increasing fat intake will promote weight loss has been circulated among the online keto and low carb community. However, this isn&apos;t true. In fact, adding too much fat to your food can backfire. In order to lose weight, you need to create a calorie deficit. 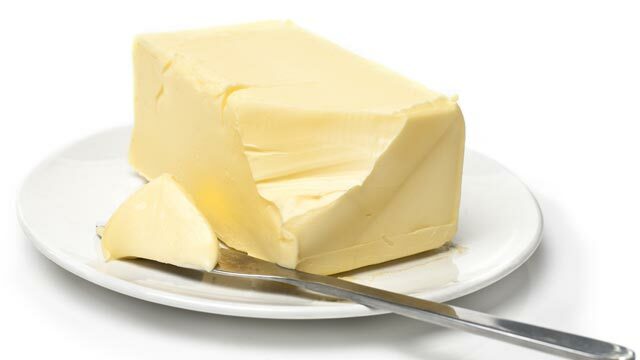 Including large amounts of butter, cream, and oil in your diet will cause you to burn more fat—but it will be the fat you&apos;re eating rather than your own body fat. If you routinely add a lot of fat to meat, fish, avocados, and similar fatty foods, you&apos;re likely to experience weight loss plateaus. Limiting added fats to a couple of tablespoons of dressing on salad and using a small amount of butter or oil for cooking may help you get the scale moving in the right direction. Alcohol can usually be enjoyed on a low-carb or keto diet when consumed in moderate amounts. However, drinking alcoholic beverages can also slow down weight loss in certain cases. Alcohol is another low-carb item that Dr. Atkins didn&apos;t allow at the beginning of his diet and removed during weight loss plateaus. In addition to potentially interfering with ketosis and promoting fat storage when consumed too often, alcohol relaxes inhibitions around food, making it more likely to overeat and choose foods you might normally steer clear of. 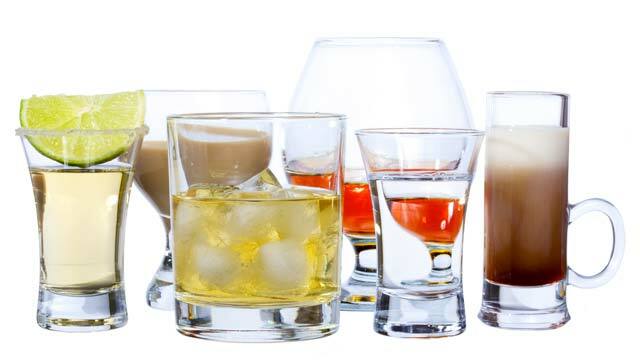 Consider limiting your alcohol intake to one or two drinks a week until you begin losing weight again. There&apos;s no shortage of recipes for low-carb and keto desserts and treats available online. The majority of them are gluten free, sugar free, and don&apos;t contain any of the questionable additives found in many processed low-carb products. In addition, these creations appear to be delicious, easy to prepare, and the perfect solution to cravings for sweets. In many cases, they are all of these things. However, they can sometimes lead to weight loss stalls. 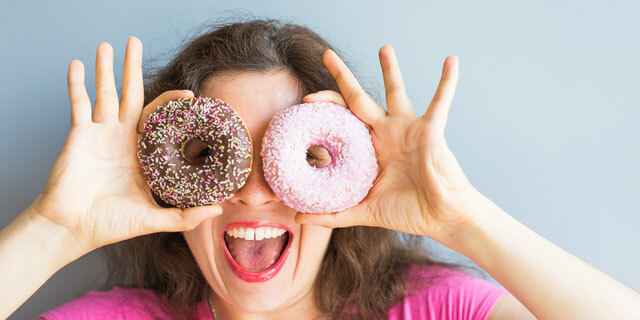 Having keto-friendy treats on hand is great for parties and celebrations, but when they&apos;re around all the time, you tend to eat more of them than you realize. Even if they only contain a carb or two per serving, those carbs can add up quickly, as can their calories. During a weight loss plateau, keto treats should only be consumed in limited amounts, if at all. You don&apos;t have to give them up forever, but when losing weight is your goal, try to focus on eating as cleanly as possible, sticking to protein, vegetables, and healthy fats. Weight loss plateaus can be very frustrating when you&apos;re consistently staying on plan yet not achieving the results you&apos;re after. However, some keto and low-carb foods are more weight-loss-friendly than others. Additionally, some people can handle more of certain foods than others without it affecting their progress. Therefore, it&apos;s important to experiment to find out how much of these foods you can handle, if any. Although it may be tough to give up some of your favorite foods, keep in mind that it may only be temporary. It&apos;s entirely possible that you&apos;ll be able to introduce them back into your keto lifestyle at some point once you&apos;ve broken through the stall. Above all, try not to succumb to extreme measures like eating only one food or fasting for several days in a row. If you eat healthy, well-balanced keto or low-carb meals, stay active, and manage stress, rest assured that you will eventually begin losing weight again. 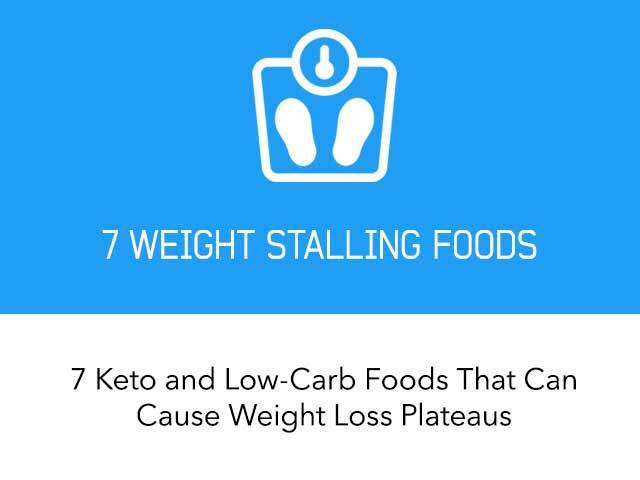 Here&apos;s our 7 Weight Stalling Keto Foods infographic we created for you - click on it to see the large version. Feel free to pin, share and print it! 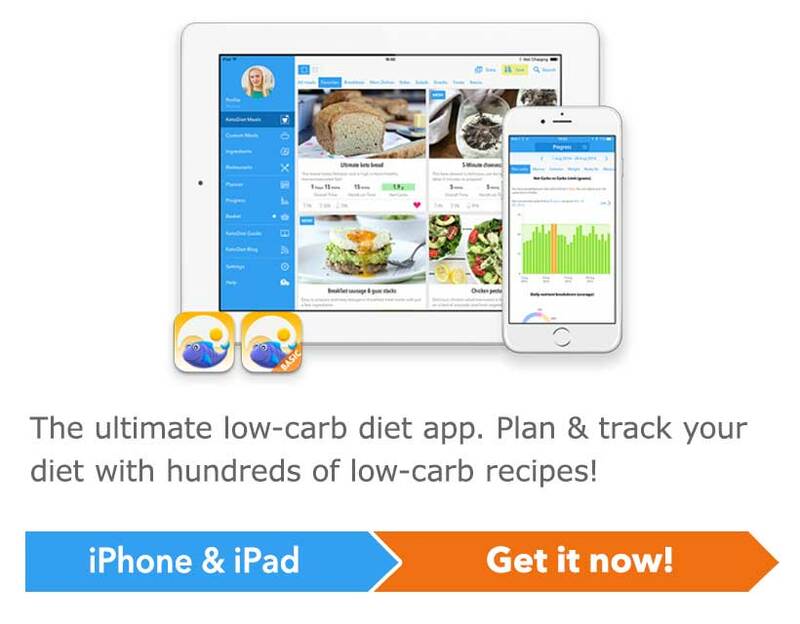 I would like to do the Keto diet plan but I am a picky eater and a great deal of the foods listed I do not like. What can I do? It seems like the problem with this list isn't the foods per se. It's that all of them are easy to grab on the run. Eat without thinking about it. Snack on them mindlessly. If you eat that way, pretty much any food will cause you to gain weight. But the list is an especially good one because it focuses on those foods that we need to track more closely than foods like leafy greens that are hard to eat too much of. Planning and tracking really are the keys. I have a vision issue that makes it really hard to eyeball portions so I weigh and measure everything. I plan my meals every week and track what I eat. That helps me keep the foods on that list to a reasonable amount. And I've never had a probem with any of them, including keto treats, because they're included in my meal plan. It's tedious to do that planning, tracking, weighing, and measuring, but if I don't, that's when I run into trouble. For me, keto treats keep me on track because my son lives with me. He buys his own food. He has his storage space and I have mine. But we're OK with sharing each other's food. I do eat some of his not too carby things like specialty cheeses, but sometimes the sugary stuff "calls to me", as it were. If I have a keto dessert around to look forward to it's much easier to say no to the high carb junk. So, that's my compromise. This write-up is really great. My wife and I both lost a lot of weight when we started Keto. After about two months we stalled out in our weight loss and this article explains a lot about why it could have happened. We basically broke all the rules in this article, lol! We both lead busy lifestyles and found it hard to keep up with the prep some weeks. When the prep started slacking, we would turn to the easy stuff and double up on it trying to reach our macro goals. Thanks for educating us on the right amounts to fill up on so that we can continue our weight loss. Thanks for your kind words about my article, Ryan! Best of luck to you and your wife going forward. I drink a premiere vanilla protein shake every morning, which has 3 carbs per serving. It is sweetened with sucralose though. Is the product ok with Keto? It's likely OK but is this manageable in the long term to rely on shakes. Try to build in a keto breakfast or more variety to keep it up long term. Hi Diane, it will unlikely spike your blood sugar but I'm not sure how healthy it is and what are the other ingredients apart from artificial sweeteners. I personally avoid all artificial sweeteners. Thank you for this blog. You just listed my top go to's. Nuts, Chees, and added butter. I usually weigh my proteins, veggies, and natural fats like fish avocado's etc. Then I add the foods listed above to get the macros I need based on the macro calculator I found on this site. What foods can I use instead? How about eggs? Hi Tamim, it really depends if you need to avoid them. These are the most common foods that cause weight stalling but if you have not experienced any issues, there is no reason to avoid them. Also, you may not need to avoid them completely but rather limit their consumption. Great info, thanks for sharing!! Calories do count although you likely won't have to count them when following a ketogenic diet. If calories didn't matter then you would never gain weight while following a ketogenic diet. This wouldn't be a desirable effect for all groups, especially not those who use the diet to manage health conditions such as epilepsy. Thank you, Dennis. Although I feel whole foods are best, I do recommend some of the Quest bars and the low-carb Know Foods products for my clients who don't have the time or ability to make their own snacks. Most -- but not all -- of these products only contain erythritol and/or stevia as sweeteners, so it's important to read the ingredients labels thoroughly. Well, All I know is I have lost 49 lbs doing Keto, started on Jan 8th, have my Bullet Proof Coffee EVERY morning, then eat lunch of 4 slices of cheese and roast beef. Then dinner, either pork chops or steak and steamed broccoli or steamed Asparagus. NEVER really hungry like I used to be for 60 years before eating breads, and sugars etc etc. That's great Eddy! I'm glad it works for you, well done! These are all foods that can potentially stall your progress and it's down to individual body responses. It's good to know where to focus when that happens. Great points! A little disappointed that Atkins is mentioned by name vs other generic references. There are plenty of "diet" "low carb" packaged foods out there in addition to Atkins. That said, your point is well taken and I have always agreed, Dr. Atkins actually knew his science. Thanks for the feedback, Midge. Sorry for singling the Atkins bars out. Agree that there are plenty of others with equally questionable ingredients! Do you think that also matters in terms of weight stalling since it is made from nuts ? A big thanks to Martina and you for helping! Thank you for your feedback, Solange. Your homemade almond milk is probably fine since the almonds are diluted with quite a bit of water. However, you may want to experiment by cutting back to half a cup a day to see if it helps you start losing again. I wish you the very best of luck!